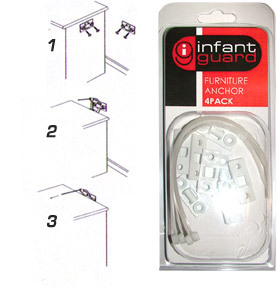 Infantguard furniture anchors help prevent young children from tipping over heavy pieces of furniture by fixing them to the wall. These anchors can be used to secure most types of furniture situated next to a wall. A) Screw one bracket to the furniture and one to the wall as shown in Fig 1. B) Locate the furniture close to its final position and insert the holding strap through the slot in the bracket attached to the wall as shown in Fig 2. C) Move the furniture to its final position and pull the strap tight as shown in Fig 3.